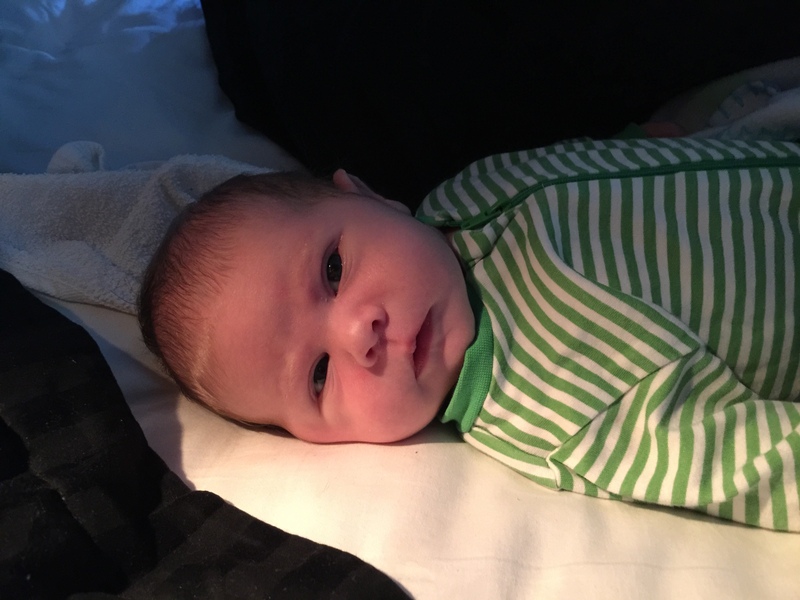 Great news everybody – on the first of April, my baby daughter was born! Everything have gone very well and the only thing clouding our happiness is the four year old who is driving us nuts with his constant chattering. He. Simply. Won’t. Stop. Babbling! He’s like the singing bush in Three Amigos! Welcome to the world, Emma Rebecka Victoria! To keep this on topic, I’m happy to say I’ve actually painted a few models recently too! First up is this robot from the not very well known Perry Rhodan range from Hobby Products (of Metal Magic Fantasy and Spacelords fame). It’s a C2141c Gladiator Combat Robot and rather out of print. Some of the Perry Rhodan minis can still be purchased from Ludik Bazaar here. 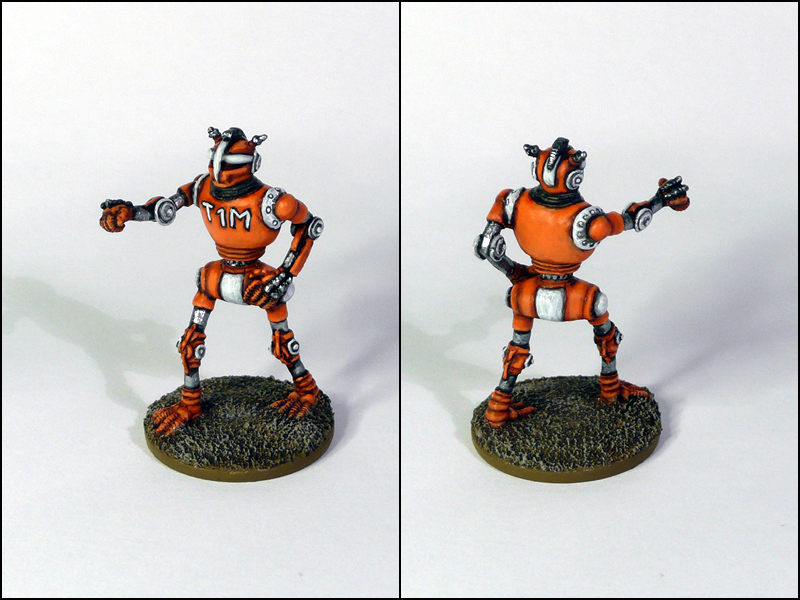 As I don’t game (or know) Perry Rhodan, ol’ T1M will feature in my Rogue Trader inspired scifi skirmish universe. Off the shelf, he’ll be known as an autonomous bounty hunter robot currently operating in the McKemmler system. There are some who call him… Tim? His origin is unknown, but that it’s a Tandoori Systems M-series (first edition) is pretty obvious. That particular range was decomissioned shortly after release as they had big problems with the persona allocation algorithms. On Tim, it have manifested in a very curteous and well behaved voice and vocabulary of a waiter at a high-class restaurant. It makes a stark, almost comedic, contrast to his murderous demeanour. 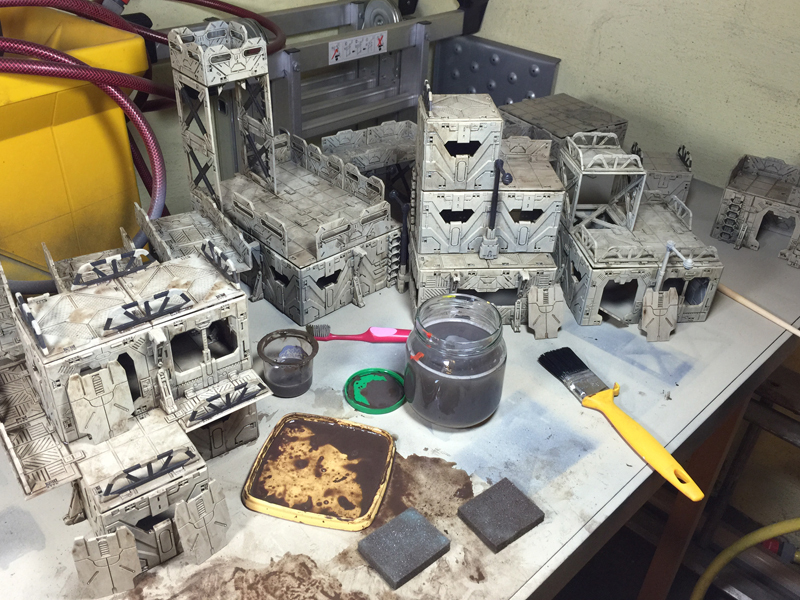 In other news, the Deadzone terrain is shaping up nicely. I’ve been struggling a bit with the base coating and probably did a few un-needed coats of spray priming (first black, then gray, then off-white) but now they’re all base coated and have had a first grime-up. Next, I’ll daub them a bit with sponges and flick splatter them with a tooth brush. After that, I’ll drybrush and possibly pick out a few things but most likely they’ll be ready for gaming after two levels of drybrush (heavy off-white, light pure white). Always nice to sneak off to the garage for a cigar and some terrain painting! Congratulations to you both on the birth of Emma Mattias. On a less significant note Im dying to see how your Deadzone terrain works out. Im dying to work on some more of mine, but I have builders in the house at the moment, so all large hobby projects are packed out of harms way for now. You in a robot phase? No, I hadn’t noticed that. ;) I have two more Rhodan robots on the boiler (only lack the Romeo bot from the range). I too know the horror of a chatterbox, although now that he has mostly stopped napping, he at least does not have the 1001 questions before falling asleep at night. Also, nice work on TIM. Killer robots of this sort are something sorely lacking from “standard” 40k.